Bring fine living to the forefront with this Gail three-piece sectional. This cream-colored sectional features two chaise ends, giving you the room you need to snuggle up and get comfortable on movie night. The upholstery is made from velvet and simply luxurious to the touch. Deep tufting all over the backs and sides of this unit add to its glamorous vibe, while the chromed legs finish off the design on a modern note. 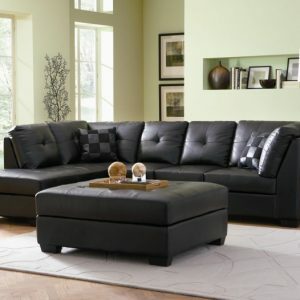 This sectional comes with pillows for added comfort and style.